Sheet copper alloy skillet of Early Medieval date, seventh to eighth century (c. AD 600 – c. AD 800). Length 348mm, diameter of bowl 188mm, depth of bowl 67mm. Weight 380g. The vessel consists of a hemispherical bowl with a slightly flattened base and a flat integral handle. The bowl has a horizontal flat rim, 10mm in width. Beneath the rim the body is slightly “waisted” to form a modest shoulder. At the centre of the base of the bowl is a small rivet hole, about 0.8mm in diameter. Inside the bowl there are three compass scribed circles which originate at the centre. The diameters of these circles are 50mm, 70mm and 94mm. The outside of the bowl has two similar compass scribed circles which also originate at the centre and are 44mm in daimeter and 54mm in diameter. About 40mm from each side of the handle is a copper alloy loop secured to the rim by two small rivets. One of these rivets, however, is missing. The loops have been made with short pieces of copper alloy wire, the ends of which have been flattened and expanded to accommodate the rivet holes. Within each loop is a free-running copper alloy wire ring which has a maximum diameter of 16mm. Each ring is very worn, due to being in contact with the loop. The flat handle is 154mm in length. 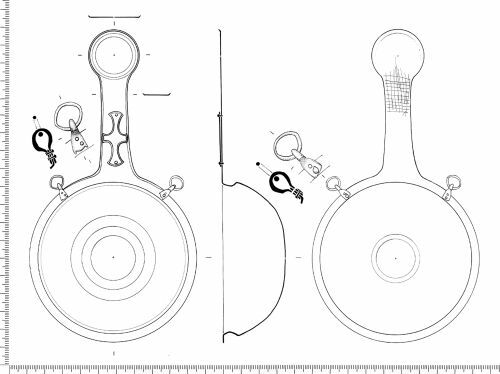 In plan, it tapers in width from 42mm at the bowl end to 30mm before expanding to form a circular terminal which is 58mm in diameter. At the centre of the circular terminal is a small circular rivet hole, about 0.8mm in diameter. On the front face of this circular terminal are three compass scribed concentric circles which originate at the centre. The diameters of these circles are 42mm, 50mm and 54mm. However, the largest circle became partially obscured during its manufacture when the edge of the handle and the circular terminal were slightly up-turned to form a small flange. There is a single compass scribed circle, 42mm in diameter, on the underside of the terminal which is. The up-turned flange of the terminal also extends along the edge of the rim of the bowl as far as each riveted loop. On the front face of the handle, close to the bowl, is a separate copper alloy cross-shaped mount secured by two rivets. The cross is in the form of an elongated cross pattee, condensed to fit within the width of the handle. Around the border of the cross is an engraved line. On the rear face of the handle, close to the circular terminal, are twenty four linear and curvilinear lightly scribed lines. Some of these lines form a grid pattern. 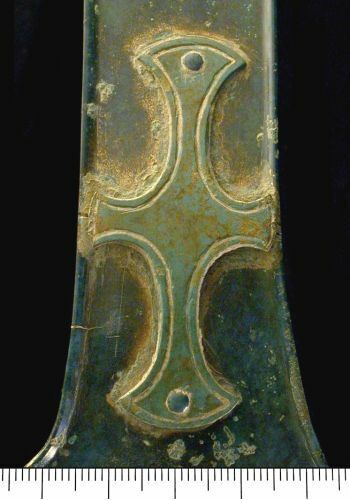 The vessel is in a remarkably good condition and has a smooth and shiny dark-green patina. However, there are small areas of superficial corrosion deposits. The cross-shaped mount on the handle has a contrasting coloured patina of a lighter green. A small dent in the side of the bowl was created by the finder during its discovery. The vessel has been identified as a seventh to eighth century skillet, possibly for use in baptism ceremonies. Other examples are known from seventh and eighth century Christian Anglo-Saxon contexts. Leslie Webster and Barry Ager of the British Museum and Helen Geake, Finds Adviser to the Portable Antiquities Scheme, have all emphasised the importance of this find. It was thought that the skillet was likely to have come from a grave. 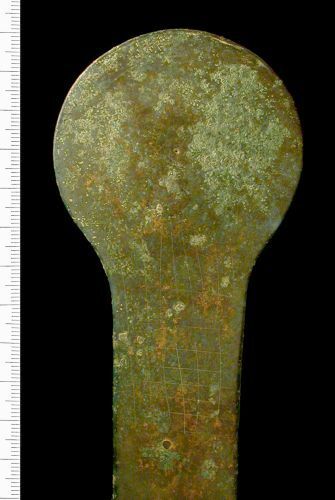 However, an excavation carried out by Frank Basford and Becky Loader, Isle of Wight Sites and Monuments Officer, in collaboration with the finder, revealed that the skillet came from a shallow linear ditch cut into the underlying limestone. Unfortunately no other significant finds were made during the excavation. The ditch, unlike other nearby archaeological features cut into the underlying limestone, is not visible on air photographs held at the County Sites and Monuments Record. However, it is clearly defined on the ground and it is thought that it could possibly represent a boundary ditch.